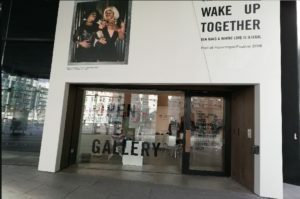 Photography enthusiasts gathered at a Liverpool gallery to discussed the legacy and impact of the city being awarded European Capital of Culture. Artist Kevin Crooks launched his second book at the Open Eye Gallery, entitled ‘You’re Only Here for the Culture’, capturing the thoughts of people affected by Hull and Liverpool receiving culture status. Liverpool won the honour back in 2008, while Hull had the equivalent honour two years ago. Mr Crooks, who is from St Helens, had a personal interest in the development of these cities because of what he had seen in his own town. His interested started from a project he was working on to do with the M62. He spent time in Hull while on his motorway assignment and saw visual similarities between the communities in Humberside and Liverpool. He made reference to Humber Street in Hull having similar qualities to the Baltic Triangle. The development of the Baltic Triangle was a large focus of last Wednesday’s event and Liam Kelly, chair of Baltic Triangle Team and CEO of Make Liverpool, formed part of a discussion panel. Alongside him was Kem Taylor, the Director of Artlink in Hull and Scottie Press editor, Joel Hansen. The panel followed on from the artist’s talk, and allowed visitors to ask questions about how cultural events have impacted their communities. When discussing the Baltic, Mr Kelly credited Jane Casey for creating the musical scene on that site before 2008, but said the Capital of Culture award allowed it to develop. Since 2012 the Baltic Triangle has had a £128m investment and a further £62m is currently on site. This money has seen the area build digital and creative businesses. Mr Kelly identified that there were differences between North and South Liverpool and says they are looking at more opportunities for the North. Becky Hatten from Liverpool attended the launch and told JMU Journalism: “This event has been very interesting. If you arrived at Lime Street Station 20 years ago you would not know where you are.